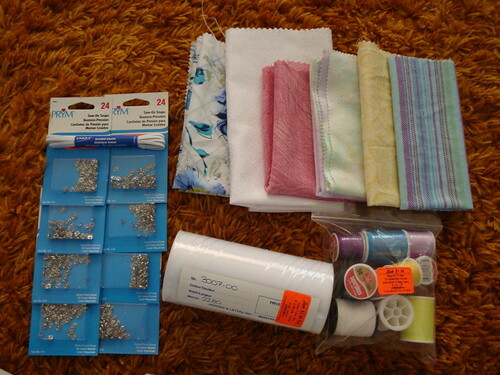 Same fabric and notions store as last weekend… I’m weak (and I forgot to buy snaps last week, so that’s why I went back and, erm, got all of this). I’ve now put myself on a ban from the fabric and notions store(s) until I use more of my fabric up! But since I can still put my entire fabric stash into a single large Ziploc bag, it’s okay, right? Still a small stash? Life was good on Friday – work went by as relatively quickly as I could have expected for a Friday. I did a lot of running around (well, more walking, but whatever). A lot of printing, a lot of note-taking, a lot of organizing my meetings for next week and booking meeting spaces in the building. I’m nothing if not inventive at times. I spent a few hours out of the house today, for shopping (I’m pointing to the photo above now, haha). I got some work done for a few of my websites (amesrpg.com and blythelife.com) and I’m still working on that pattern that I meant to get out a month ago… Whoops? I guess things just got in the way of me finishing is all. My sister just came in to talk and was looking over my shoulder at WordPress and asked how many websites I had now. I asked if she mean domains or domains + subdomains. She meant domains, and the answer was “I have to count”. I only have five right now, 4 dot-com and 1 dot-net, but I still have to count on my fingers. And I say them in my head in alphabetical order so I don’t forget any of them. It’s a good thing she didn’t ask how many subdomains I had, because I don’t think I’d be able to fully answer that without logging in to check… =/ Too many to count? Do people actually keep track of all their subdomains? Cripes. If you do, you’re more organized than I am… Teehee. Hope you all had a lovely Saturday! What did you do today? Jeez, 5 domains? Where have I been? Haha. Thats awesome though. I want another but eh, we’ll see. I need to update my current alot more. If it is an uncontested divorce, only the person requesting it has to be there. Not sure why, but thats how it is here.